Starting with the So...? 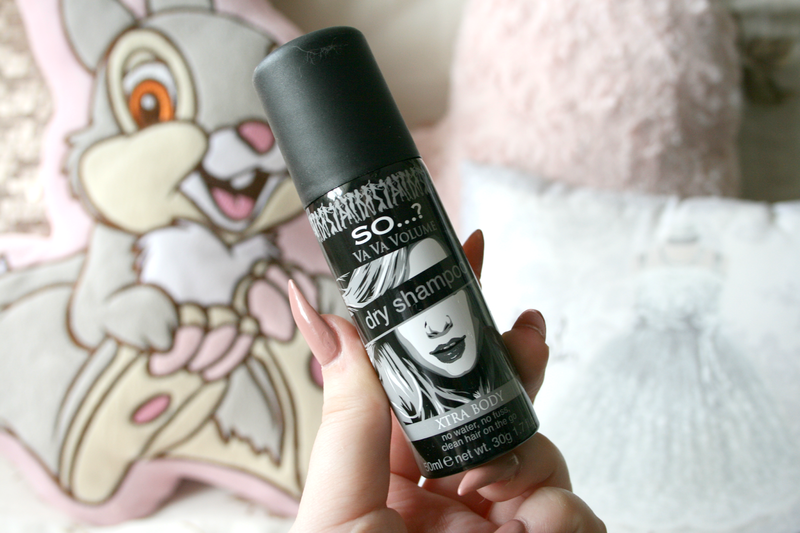 Lovely Floral & Flirty* dry shampoo. This is probably one of the most fragranced dry shampoos I've ever come across, because of that I find that throughout the day if a gust of wind blows my hair or I simply swipe it away from my face I can still smell the perfume. 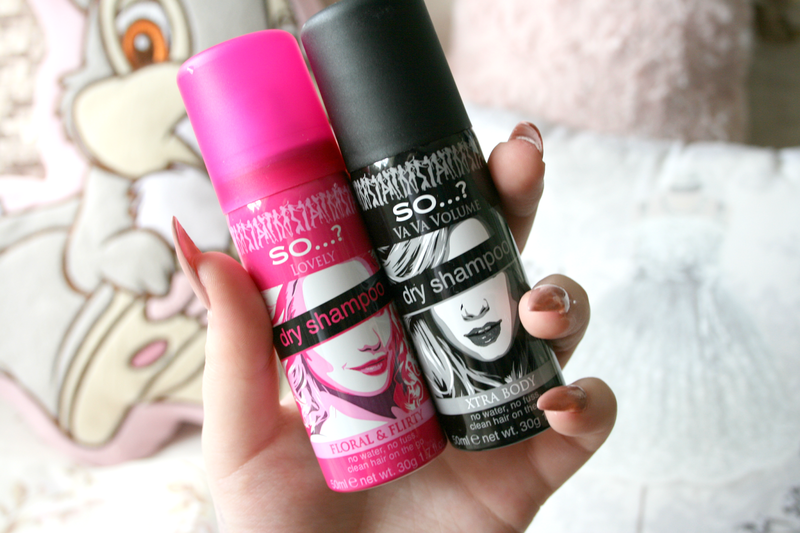 This dry shampoo is just designed to freshen up second day hair while giving it a pretty girly scent. I found this formula pretty invisible, unlike batiste it wouldn't spray out full on white, only every now and then you'd get the odd speck. Now I'm not a huge fan of invisible formulas as I find they don't absorb the oil as well as ones that spray out white. I did find that this cleaned my hair but I did need that little bit of extra product than I would if I was using a Batiste one. However it did still clean my hair and kept it looking fresh all day long. Out of both products the So...? Va Va Volume Xtra Body* dry shampoo was my favourite. Aswell as keeping my hair clean and smelling fresh it looked as if I had just spent the past 10 minutes backcombing my hair and I loved it! I also really loved the scent of this one as it wasn't as over powering as the other one was much sweeter. This I found cleaned my hair just as fast as the Batiste one would, the formula I found for this one was a little more powdery helping it soak up oils much quicker. Along with the fact that it really gives you that umpth look to your hair. I loved this for when I was wearing my hair in a pony as I could use this to give it a lot of volume, helping me save time backcombing. The So...? Dry Shampoo range will set you back only 99c for a 50ml bottle as an introductory price which is definitely a great price for you to give it a trial, even if you don't end up liking it you haven't lost out on money really! Its also the perfect little travel companion as it's so small you can simply pop one into your bag and bring it everywhere with you. You can find the So...? Dry Shampoo range in Pharmacies nationwide! Have you tried the So...? Dry Shampoo range yet? beauty . dry shampoo . haircare . review . so...? I used to love Batiste ones, but recently bought the TIGI Bed Head Oh Bee Hive Matte Dry Shampoo and nothing compares to it. In comparison to Batiste it smells SO SO SO much better and the effect is really texturing without being at all chalky. It's a winner! !